What do these CottageCutz dies have in common? 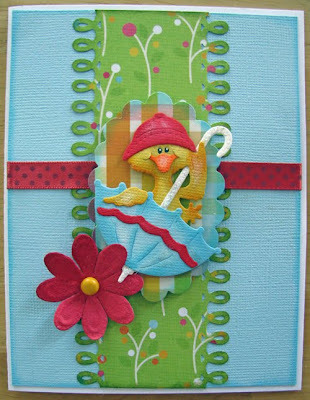 I used pieces of all these dies to create my Happy Easter Card below. 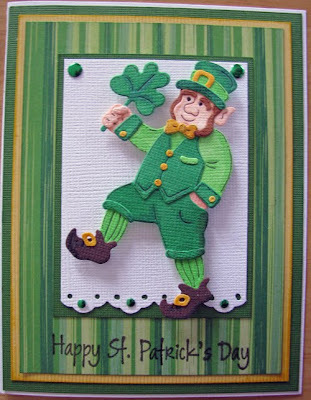 There are so many possibilities with die cuts, you can certainly use them as shown or mix them up with different dies to create something completely different. 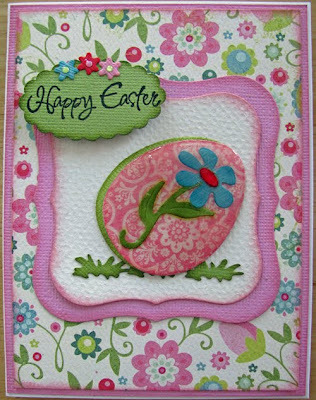 I took the Easter egg die and cut it from patterned paper and then cut another one from limeade Bazzill cardstock. I inked the edges of both and then cut out the mini Daisy and inked that and glued it to the egg. I then took Glossy accents and covered the whole egg with it. I used the grass from the Picnic table die and the little flowers from the Sheep w/flowers die. I hope this helps you to think outside each individual die and think of the BIG picture when you create your next project. Have you ever seen diecuts anywhere that are as detailed as CottageCutz? These dies come in so many unique cuts and this Easter Egg Stand is no exception. I apologize for poor quality picture on this card - it's cloudy here in Utah and hard to get the lighting I need to take a good picture. This 2 die set gives you so many possibilities. 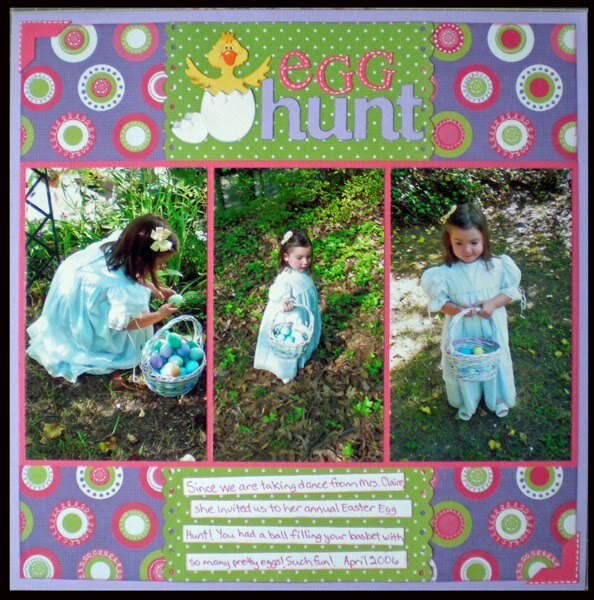 It come with these 3 different basket choices, the option for Easter Eggs title or a blank one so you can create your own as I did with the Happy Easter stamp. There are eggs together and seperate, flowers, bows etc. I cut this out with white cardstock and colored the pieces in with Copics. I also used a little Stickles on the tulips and some Glossy Accents on the eggs and chocolate rabbit. Happy Monday! These is the final pictures of my Easter Mini Book for my parents. They will love seeing these cute pictures of their great grandchildren. . This page is acrylic. I used the eggs and vines from the Cottage Cutz Spring Embellishments. I love the versatility of these dies. (Sorry about the pictures, had camera problems.) To give the eggs a little sparkle, I covered the eggs with Cotton Candy Distress Stickles. I think I will add a few pages to the end of my book for pictures from Easter 2010. I put the flower and the ribbon from the Watch For It Wednesday on the front of my book. In addition, I added several other pieces of ribbons to the rings. This will be my last post! It has been a pleasure to work with the wonderful ladies on the Design Team. Thank you to all the awesome Blog Followers who read this Blog. Happy Easter. Hurry!! Only three more days left to save with Introductory Pricing on the newest Cottage Cutz "In the Garden" release!! These dies will start shipping mid-April. 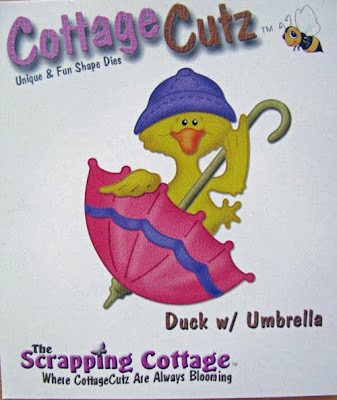 All Easter and Spring Cottage Cutz Shapes are in stock and shipping now! For today's post, I chose to create a layout using the adorable Duckling, Just Hatched Cottage Cutz Die from the Easter Release. I am so glad I ordered this little duck! At first I wasn't sure how I was going to use it, but then I realized it is just so perfect for any Easter page I might be working on. I can see this little guy showing up a lot in my albums in the future. I used my Copic Markers to add some shading to the cracked egg and some outlining to the duck. There are so many great Spring Cottage Cutz dies to choose from right now at The Scrapping Cottage! Be sure you get your orders in early enough to fill your own Easter baskets!! With Easter a little over a week away, I wanted to finish up my table decorations. If you remember a few weeks ago I created a center piece for my table using the New CottageCutz Easter dies, see my "Preparing for Easter" post. I only needed to add the finishing touches to my table by making some name place holders. I created the name place holders using wooden clothes pins. I painted the clothes pins white to match the wooden crate of the my center piece, then added a bit of brown ink to distress them. The clothes pins stand good with the jaws up, this way they can hold the name cards. I cut the CottageCutz Bunny, Girl die out of chipboard first and then added the colorful cardstock die cuts on top for added strength. I had some left over grass from the center piece, so I added a bit behind each CottageCutz Bunny. The final step was to create the name cards and slip them into the clothes pin jaws. 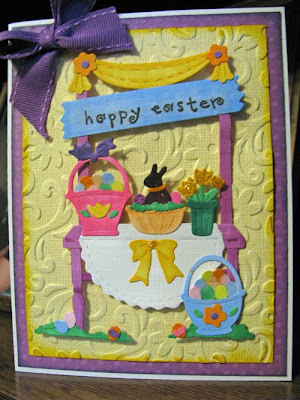 Here is my Easter table, all the decorations are done using the New CottageCutz Easter dies. Welcome to Watch for It Wednesday!!! I saw this fun technique with Alcohol Inks and thought I would share it with you. You will need some alcohol inks, a small spray bottle, white flowers, and blending solution. Put some water in your mini mister. Add your favorite color of alcohol ink to make your desired color. Spray the white flower with the ink mixture. After the flower is completely covered with the ink put the Blending solution in the middle of the flower. This will give your flower a tie-dyed look. My picture really doesn't do this technique justice. You should give it a try. You can also use this technique on ribbon, glass, bottle caps and the pieces of your die cuts. Well, the calendar says it's Spring and it feels like it is here in Utah as well. Is there a more welcomed season than Spring after a long cold winter? 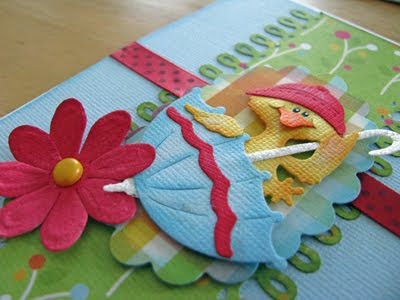 This CottageCutz Duck w/Umbrella die is perfect for those spring cards and layouts as well as Easter. Here is a closeup of the Duck w/umbrella. Happy Monday! Spring is in the air and Easter is coming quickly. I am working on making this little book for my parents for Easter. This is the 3rd page in my little book. I used the Cottage Cutz Duckling, just hatched and the flowers from the Cottage Cutz Spring Embellishments. The Duckling just hatched is a great addition to my layout and the die was s easy to use. Check back next week to see the completed book. Working with these new Cottage Cutz dies from the Easter Release is really putting me into a Springtime mood! I thought this new Prima paper would be perfect with the Cottage Cutz butterfly. I also used the Cottage Cutz Mini Daisy to accent the corner of my photo mat. 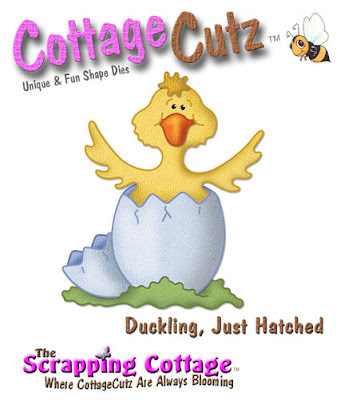 Be sure to check out the newest March Spring Cottage Cutz release! I just had to figure out a way to use this adorable CottageCutz Frog w/ Branch die on a layout. I came up with this fun title and he was the perfect accent. I cut one complete CottageCutz Frog w/ Branch die to use with my title. Then I cut only the top half of another frog and tucked him behind my photo. 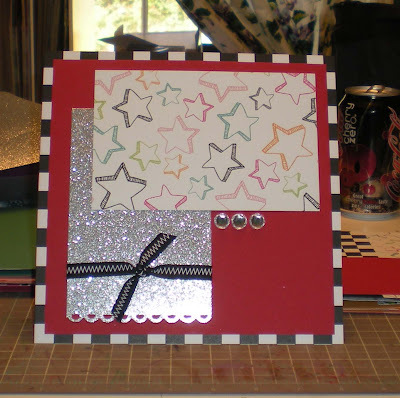 My Watch for it Wednesday post for today is a fun little tip you can use when working with glitter cardstock. Do you love using glitter paper as much as I do? 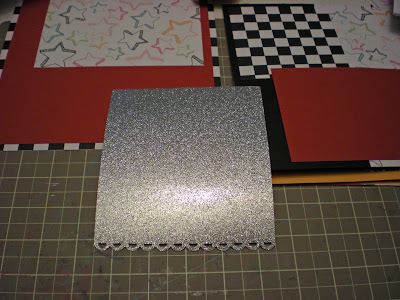 It is such a great and easy way to add some wonderful sparkle and bling to your projects. However, have you ever noticed that certain papers seem to "shed" glitter more than others? 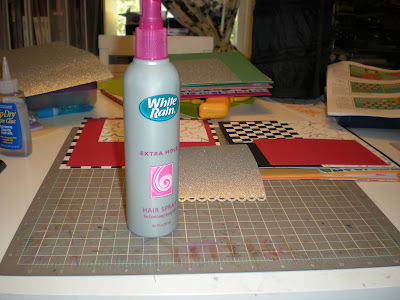 Next time you are using some glitter paper, go in your bathroom and grab a can of hair spray. Position your paper so that you have protected the area around it from over spray. Hold the can about 8 to 10 inches away from the paper and lightly spray over the piece of glitter paper in a sweeping motion being careful not to stop over any one area. You don't want to get too much spray on the paper or it will become too sticky and "gunked up". After you have finished spraying, give it a few seconds to dry and then it will be ready to adhere to your project. You may still lose a few specks of glitter if you really rub the paper, but otherwise, you should notice a big difference. Hope you have fun trying this technique for yourself! Come back tomorrow for another fabulous project from our very talented Karen! Isn't she cute??? I know I say this a lot but I can't help it. It never ceases to amaze me how cute these CottageCutz dies are, especially when I actually create something from them. Today I'm featuring the Girl bunny. I chose the paper I wanted to use and then simply made the details on her to go with my paper. I used a dauber to apply some ink around the edges of my pieces and added a little paint to make the white in her eyes, on her nose and on the egg. Think of all the pretty spring papers you can make this cute bunny go with by changing the colors in the egg, her bow and flower. Happy Monday! Today I will be using the Cottage Cutz Truck w/Hay and the Spring Embellishments. 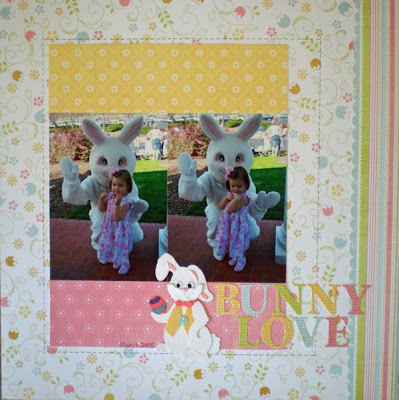 This is the second page in my Easter mini Album. I used the truck die from the Cottage Cutz Autumn Release and put the eggs from the Spring embellishments in the bed of the truck. To enhance the flowers I added pearls to the center of my flowers. These Cottage Cutz dies are so versatile. I love how you can use parts from different dies to create your own die. 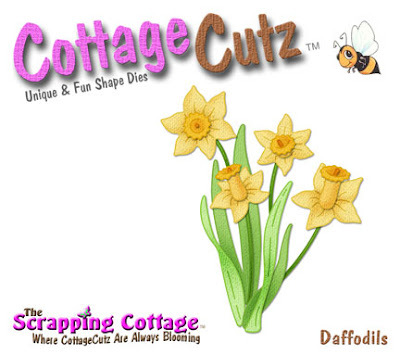 Today, I am going to be showcasing the fabulous new Cottage Cutz Daffodils Die. The Daffodils die was the first one on my list from the Cottage Cutz Spring Release. Fortunately, the family from whom we bought our current house loved blooming plants. In our backyard, there is a ring of daffodils planted around an old bird bath. My girls love these daffodils! I try to make a point to take pictures of the girls with the flowers each year. Luckily, we have a fantastic "crop" each year because there is nothing my girls love more than picking flowers! To create my diecut, I ran the Daffodils die through my die cutter with white cardstock and then used my Copic markers to color each of the different pieces. I used "Buttercup Yellow" to color the daffodils petals and then I matched the green leaves to the greens of the striped fabric paper. These flowers piece together so quickly and easily. I can't wait to use it again to create even more unique daffodils. I hope you have a fun and scrappy weekend!! ETA - We finally had a little sun today, so I was able to get a better picture! With Easter fast approaching, I wanted to get a jump start on creating some decorations for my home. 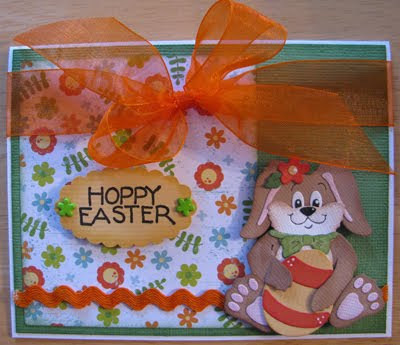 What better way to make some adorable Easter creations than with the New Easter CottageCutz dies. These are the CottageCutz dies I will be showcasing today. I decided to start with making a center piece for my dining room table. I got the wooden crate, faux grass and sticks at Hobby Lobby. I painted the wooden sticks white to match the crate. All of the CottageCutz dies are glued on the sticks and stuck into floral foam. I added some ribbon for the finishing touch. Close-up of the CottageCutz Mini Chick on outside of crate. Close-up of all the CottageCutz dies in the grass. Have a blessed Thursday Everyone! Today I wanted to show you some fun ways to use your dies making projects with your children or grandchildren. These are fast and simple projects using ordinary items from around your house. 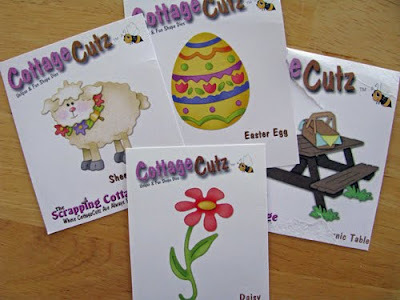 I will be showcasing dies from both the CottageCutz Valentine Release and the CottageCutz Easter release, but these projects would work great with any holiday or theme. ***Brown Lunch Bag Valentine Treat Bag. 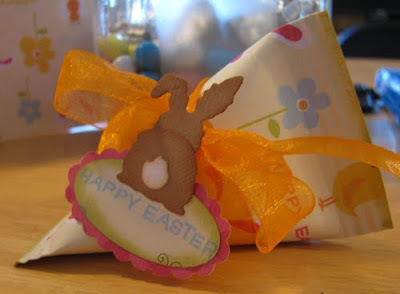 Fold over the top of the lunch bag, punch some holes and slip the ribbon through. Using the ribbon, add a tag. Decorate the front using the New CottageCutz Valentine dies. ***CottageCutz Heart Doily Lolly-Pop treat. Cut the Heart Doily, remove all cut outs. Slip the Lolly-Pop through the two heart cut outs on the Doily. Slip the Ribbon through the swirls cut outs on either side of the Lolly-Pop and tie a bow. 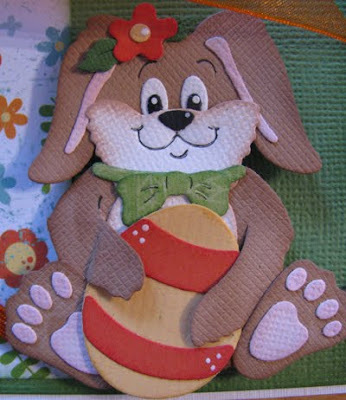 ***Brown Lunch Bag Easter Basket. Cut the lunch bag in half with Deco scissors. 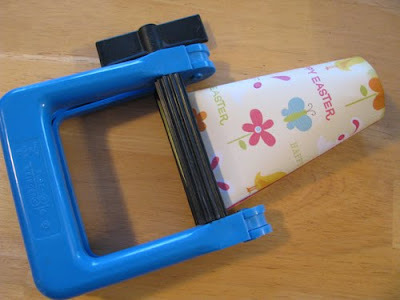 Using the Deco scissors again, cut a 1"x12" handle from cardstock and attach to bag. I also recommend cutting a piece of cardstock to place in the bottom of the treat bag to make it more sturdy. 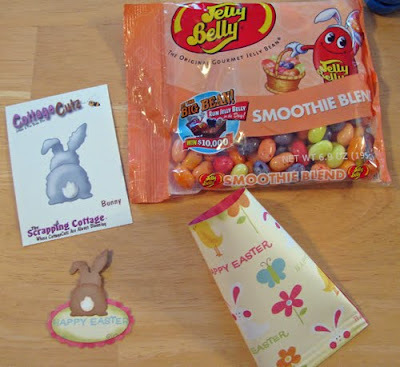 Decorate the front of the treat bag with the New CottageCutz Easter dies. ***CottageCutz Easter Egg Lolly-Pop treat. Cut the Easter Egg. Punch two holes in the Egg. Slip the Lolly-Pop through the holes. Add a bow around the Lolly-Pop. Cut 1" rings from either a paper towel or toilet paper roll. 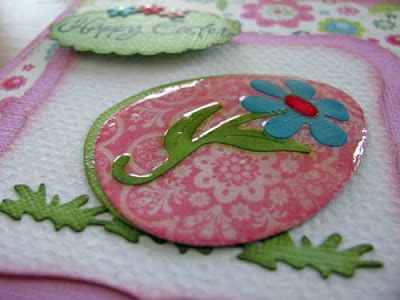 Cover the 1" rings with paper and add the New Mini CottageCutz Easter dies. 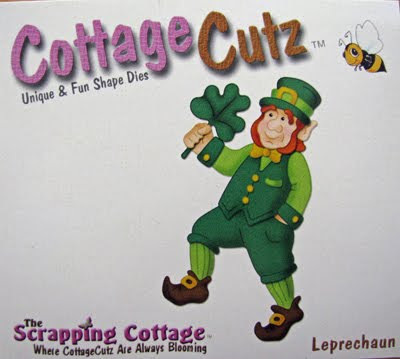 If you celebrate St. Patrick's Day than this authentic looking CottageCutz Leprechaun is a must for your collection. I cut him out of white textured cardstock and colored him in with my Copic markers and did a little outlining with my fine tip Zig pen. 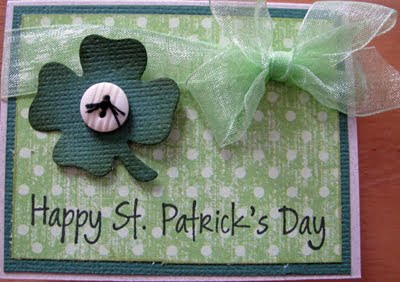 I made this cute little tag with the CottageCutz mini Clover which will be perfect with a plate of cookies. We'll see you back here tomorrow with a Watch for it Wednesday post from Karen. Happy Monday! With Easter around the corner, I decide to design a mini album for the occasion. 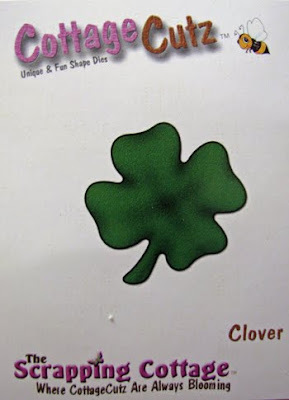 The front page of my mini album is acrylic. The Cottage Cutz Mushroom Trio is perfect for the front page. I think the Cottage Cutz Boy Bunny from the Easter Release is just the perfect Easter Bunny to add to any Spring or Easter project! Since the bunny in my pictures is white, I decided to make the Cottage Cutz Bunny white as well. I used a very light grey Copic marker around each of the white pieces to give them a little definition and then I changed the color of his clothing to coordinate with my papers. 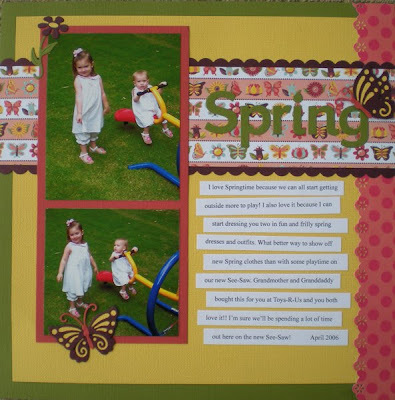 These are old Imaginisce papers but still some of my favorites when I am working on Spring and Easter layouts. Good thing I stocked up at the time!! Remember, only 4 more days left to take advantage of introductory pre-order pricing on the newest Cottage Cutz March Spring release dies!! A Froggie Park Party. I couldn't wait to get this adorable CottageCutz Frog w/ Branch die. I knew it would be perfect to use on the invitations and goodie bags for my sons 7Th birthday. I only added a bit of shading using ink to my frog. He was almost perfect as is. This is a close-up of the invitations. Here are the goodie bags and invitations. I wanted to say "Thank You" to the Owner and DT of the Scrapping Cottage for giving me the opportunity to be a guest designer for 6 months. I feel so blessed! 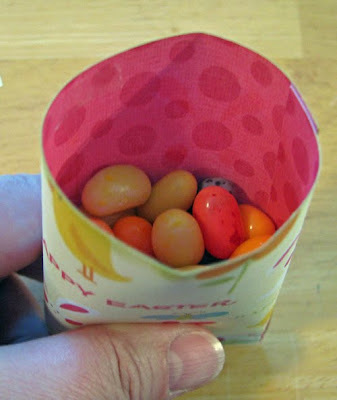 Today I'm going to show you how to make a really cute, but simple treat container. If you've ever gotten a baked potato at a restaurant you may have a gotten some sour cream in a funky little container, well that's what I'm going to show you except this one contains a treat instead of sour cream. 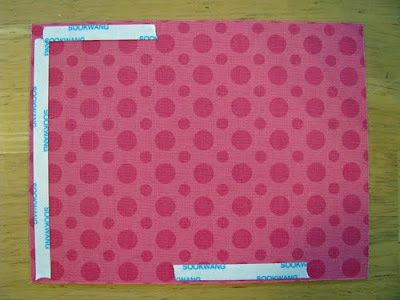 Start out with a 5 1/2" x 4 1/4" piece of double sided patterned paper. I like to use a heavier weight paper myself. Then apply some adhesive as shown. Then make a cylinder using the edge with the adhesive to seal it up. Then take a corrugator and put a few crimps on the edge with the adhesive. This leaves you with an open end to put your treats inside. Leave some room at the top to seal the end. Then where the other strip of adhesive is seal together going the opposite way to form the sour cream container look. Add the crimps with the corrugator again and whatever tag and ribbon you like and there you have it! 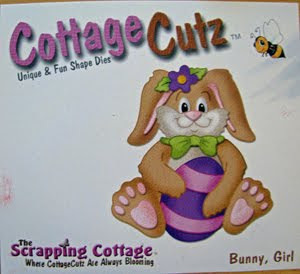 I used this adorable CottageCutz Mini Bunny for my tag. Since I have a real bunny rabbit this was a must have for me, it makes me smile when I see this cute bunny bum. Too cute! 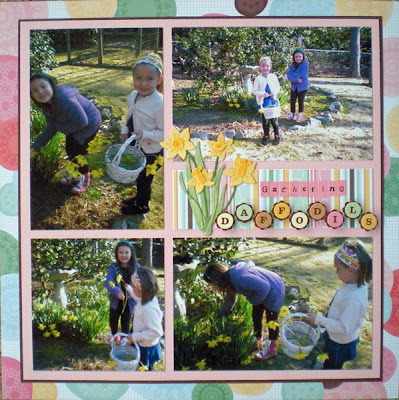 The Scrapping Cottage is sure to have whatever Spring/Easter diecut you're looking for.